If there's one thing we love to eat at our house, it's shrimp. It's also potatoes. Hmm, it's corn. Wait, don't forgot the onions, too! 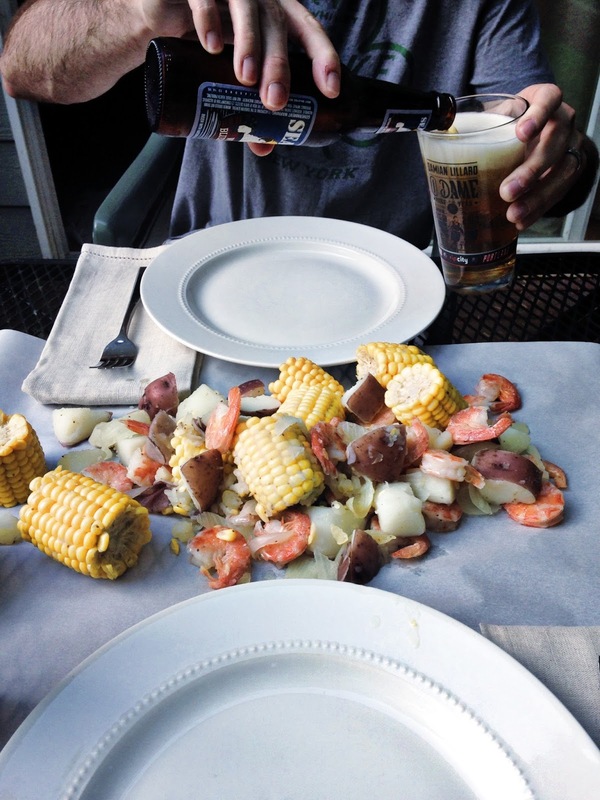 Throw all those ingredients together in a pot containing water seasoned with Old Bay and you have yourself a low country boil, one of our favorite summertime dinners. It's super easy, tastes delicious and is great to make when you have friends over for dinner and you can all eat outside. A beer or two goes perfect with this meal, of course. Fill a pot of water 1/4 of the way with water. We use a Le Creuset pot and it's just the perfect size. Season the water with Old Bay seasoning. When the water comes to a boil, add your potatoes and cook for 7 minutes. Add your onions and corn on the cob, cook for 8 minutes. Add your shrimp and cook for 3-4 minutes. Strain out the water and serve on butcher paper. This recipe is just my super easy method. You can adjust the quantity of ingredients to your needs. You can also add items like sausage, we just didn't have any on hand the other day when we made this. mmmm this is making me hungry! xo jillian - cornflake dreams stop by! I'm hosting a giveaway. Oh. Holy. Wow. I can't wait to try this!! !